(Nanowerk News) Researchers at ETHZ Zürich, EPFL Lausanne and at the University of Fribourg have evidenced a basic general mechanism describing how filamentous proteins assemble into ribbon like structures, the so-called Amyloid fibrils. Combining experiments and theory, they could explain how denatured milk proteins assemble into ribbon like structures composed of up to five filaments. These findings are shining a surprisingly new light on the assembly of these proteins. The Atomic Force Microscope depicts on its screen the few nanometer thick and few micrometer long fibers as white flexible sticks, crisscrossing the surface on which they are deposited. The very peculiar property of these proteins lies in fact that they can self assemble into complex ribbon-like twisted fibers. Researchers at ETHZ Zürich, EPFL Lausanne and University of Fribourg have teamed up to take Atomic Force Microscopy images of the fibers and to analyze them using concepts from polymer physics and theoretical modeling. This combination of expertise has lead them to propose a set of general rules governing the assembly of filaments into thicker and twisted ribbon like fibers. Their results are published in the current issue of the scientific journal Nature Nanotechnology ("Understanding amyloid aggregation by statistical analysis of atomic force microscopy images"). “The model that we propose is extremely precise in its predictions“, says Raffaele Mezzenga, Professor of Food and Soft Materials Sciences at the ETHZ Zürich. “Up to now there was no such exact and general model for the formation of Amyloid fibers”, continues Giovanni Dietler, Professor of Physics of Living Matter, at the EPFL Lausanne. The structure of the Amyloid fibers as it was unveiled by the experiments, surprised the researchers. Single proteins build the long filaments and subsequently the filaments assemble side by side to form the ribbon-like twisted fibers. Mezzenga explains that the ribbon-like structure is the logic consequence of the strong charge carried by the building blocks of the fibers. In fact, the single proteins feel a strong mutual repulsion preventing them to pack and the ribbon structure is the only one that permits to limit this repulsion. Presently one missing information in the present model, is the exact nature of the short range attraction between the building blocks that drives in the first place the assembly among the protein filaments. Scientists agree that along the filaments there are charge-less domains of hydrophobic character (water repellant) that are the source of the short-range attraction. So there is a balance between attractive and repulsive interactions and the results is the ribbon like twisted conformation. Self-organizing proteins are common in living matter and they are found in large aggregates for example in blood coagulation. Spherical like proteins are used in food industry as emulsifiers, gelling and foaming agents and in vitro they form Amyloid like structures. These latter fibers have properties (elasticity, solubility, etc) favorable for food texturing or to produce special structures. The milk protein beta-lactoglubulin studied by Mezzenga and his colleagues is at the beginning spherical and by a heat treatment accompanied by acid environment it aggregates into the filamentous structures. Beta-lactoglobulin is an important component of the milk serum and therefore very relevant for food industry. The knowledge gained by the scientists on this food protein can potentially benefit medical sciences. In fact Amyloid-like fibers appear in humans affected by neurodegenerative diseases, like Alzheimer- or Creutzfeldt-Jakob disease. 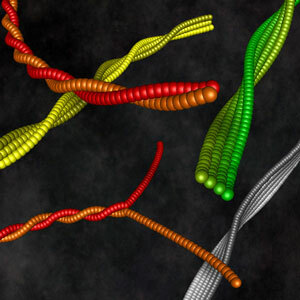 These human fibers, although made out of a very different proteins, are also ribbon-like and twisted and their assembly into long aggregates is presently under intense scrutiny. The model proposed by the team could also help to understand the genesis and development of theses diseases.